Martha O' Donovan appears at the Harare Magistrates court escorted by a plainclothes police officer shielding her face in Harare, Saturday, Nov. 4, 2017. An American woman charged with subversion in Zimbabwe for allegedly insulting the president on Twitter as a "sick man" made her first court appearance on Saturday as her lawyers disputed the charges that carry up to 20 years in prison. 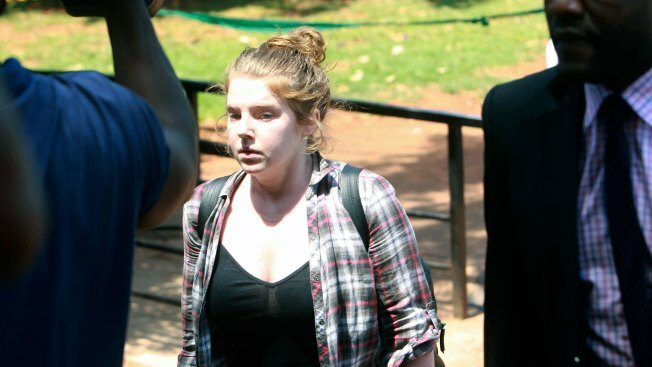 A lawyer for 25-year-old Martha O'Donovan, Rose Hanzi, told the court that the subversion charge was illegal because police did not inform O'Donovan of it when she was taken from her home in the capital, Harare, on Friday morning. The court disagreed, and O'Donovan will remain in custody over the weekend. Hanzi said they will approach the High Court for bail on Monday. O'Donovan made no statement in court and showed no emotion as the request was dismissed. She waved to a small crowd of supporters as she was escorted into a prison truck. O'Donovan is accused of calling 93-year-old President Robert Mugabe a "sick man" in a Twitter post that included a photo illustration of the president with a catheter. The charge of subversion carries up to 20 years in prison. O'Donovan also is charged with undermining the authority of or insulting the president. O'Donovan has denied the allegations as "baseless and malicious." It was the first arrest since Mugabe last month appointed a cybersecurity minister, a move criticized by activists as targeting social media. Zimbabwe was shaken last year by the biggest anti-government protests in a decade. Frustration is growing in the once-prosperous southern African nation as the economy collapses and the president, in power since 1980, is already running for next year's elections. O'Donovan had been working with local social media outlet Magamba TV, which describes itself as producing "satirical comedy sensations." O'Donovan, a graduate of New York University, has called herself a manager for Magamba TV and a "media activist." Earlier this year, she presented a talk at a re:publica digital culture conference on "How Zimbabweans Rebel Online." O'Donovan's family could not immediately be reached for comment. The State Department said that "we are aware of reports that a U.S. citizen was detained in Zimbabwe. We stand ready to provide appropriate consular assistance for U.S. citizens. Due to privacy considerations, we have no further comment." "This arrest marks the start of a sinister new chapter in the Zimbabwean government's clampdown on freedom of speech, and the new battleground is social media," said Amnesty International's deputy regional director, Muleya Mwananyanda. The statement said Zimbabwe authorities tracked tweets to O'Donovan's IP address.